A woman's period has been a taboo topic for A LONG time. If you're a woman reading this, I'm sure you have had at least ONE embarrassing period moment happen to you - I know I can think of four right now. I remember being in middle school and just about EVERYONE was getting their period but me. It felt like a badge of honor I had missed out on, so in the 8th grade, I lied about getting my period and the fanfare I received from my friends was TOTALLY worth it at the time. Seriously, I got SO many notes folded up like paper footballs welcoming me to the club and congratulating me on being a woman. Yes, this is slightly embarrassing that I lied about getting my period so that I would be accepted by my friends - but you know what's kind of messed up about this? [Beyond me lying of course.] Getting our periods was SUCH a monumental occasion for us - we celebrated it! And just as quickly as you would blow out a birthday candle - our periods went from something to be celebrated to something to be hidden. When I finally got my period freshman year of HS, at 14, I was FREAKED. I had NO idea what to do, I had nothing on me and I couldn't ask my friends for help because, HELLO, I had lied about getting my period the year before! Fortunately it happened at the end of the school day so I didn't have a complete crisis on my hands - that could have been A LOT worse! Over the years I've had other run-ins with my period - not having a pad or tampon, leaking through my pants, intimate moments, starting my period the instant I crossed the finish line at a XC meet, etc. and each time I've felt pretty alone and embarrassed about it, having to hurry up and come up with a solution to fix it in secret. Why? Why is it something that so many of us, myself included, know so little about and think of as something to be shamed and kept hidden because it's gross? Periods are a part of life. Not just for women but for all of humanity. Periods are a part of the life cycle and they shouldn't be shamed or thought of as gross - it's natural and it's part of being a woman and part of creating life. But, periods are also SUPER wasteful. All those liners, pads, tampons, plastic applicators, etc. not to mention the money that goes into buying all of those supplies. Think about it, the average woman will have 350-450 periods in her life and if you go through a box of tampons each time, like I did, that's $2500 - $3300 dollars just for tampons! My period journey started changing when I began cycle-synching a little over two years ago after hearing Alisa Vitti interviewed on a podcast and then reading her book Woman Code. I swear by cycle-synching! It's the best thing I've EVER done for my health and reconnecting with my body! I also have Miki Agrawal to thank for helping me reconnect with my period. She founded Thinx - a period underwear company. She is ALL about erasing the taboos around what our bodies do naturally - she also has companies around pee-proof underwear, bidets for the modern pooper and she got a lot of flack for pumping her breasts while DJing and being awesome at Burning Man last year. I LOVE her - you've got to check her out! 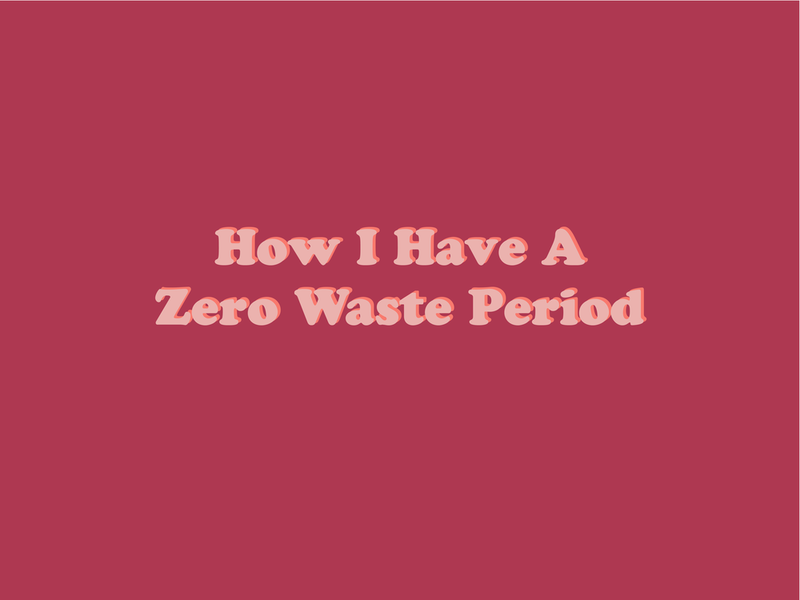 Then of course, there's Bea Johnson, the mother of the modern Zero Waste movement. I heard her interviewed on a podcast as well which lead me to reading her book and adopting a Zero-Waste lifestyle to begin with. She talked about the Diva Cup for a zero-waste period, but I was still pretty skeptical. After being Zero-Waste for a while, I purchased a Diva Cup and now there's no way I'm ever going back to tampons and pads! For some, the thought of using a menstrual cup is gross. And I will say, it takes some getting used to, but it's totally worth it! I made the switch so that I would stop creating so much waste each month for my period and the money savings was just an added benefit - but what I never expected to get out of it was being more connected with my body and what it means to be a woman! Seriously. Periods are so COOL. I'm fortunate in that I've never struggled with painful periods - but I do have very heavy periods. Maybe it's my body's way of making up for lost time since I started so much later than a lot of people. I'm extraordinarily heavy for about 2.5 days and then it's barely there for another 2.5-3.5 days. I'm so all or nothing - even my period is on board. HAHA. So because of that, I wear Thinx underwear in combination with my Diva Cup. They both are washable and reusable AND when you purchase a pair of Thinx underwear, a girl in Africa is given a set of reusable pads so that she won't have to quit school and eventually drop out due to her period. You'll wonder why you weren't doing this from the start! So, what are you waiting for?! Make the switch and make your periods Shame-Free & Zero Waste to help save the planet, yourself and your wallet!